Συντάκτης: dikaiopolis , ημέρα Παρασκευή, 31 Οκτωβρίου 2014 και ώρα 1:50 π.μ. Ignoring international law, the American president, Barack Obama, fine tunes his aerial bombing campaign in Syria with his allies in the Gulf (New York, September 23, 2014). Though everyone adheres to Washington and its Gulf allies’ anti-terrorist discourse, everyone understands that it is only a rhetorical justification for a war that has other purposes. The United States say they want to destroy the Islamic Emirate which they created and which performs for them the ethnic cleansing necessary to its plan for the remodeling of the "Broader Middle East". Stranger still, they say they want to fight in Syria alongside the moderate opposition which is composed of the same jihadists. Finally, they destroyed Rakka buildings that had been evacuated two days earlier by the Islamic Emirate. For Thierry Meyssan, behind these apparent contradictions the gas war continues. • In May 2013, Senator John McCain came to Syria illegally to meet the staff of the Free Syrian Army (moderate), including Abu Youssef, also known as Abu Du’a, alias Ibrahim al-Baghdadi, the current caliph Ibrahim (Head of the extremists) . • In January 2014, Reuters revealed that President Obama had called a secret session of Congress during which it voted to fund and arm the "rebels" in Syria, including those of the Islamic Emirate until September 2014 . It was indeed a secret session and not just behind closed doors. The entire American press complied with the censorship of this information. • In May 2014, Saudi Arabia handed over new heavy weapons and quantities of new Toyotas (purchased in Ukraine) to the Islamic Emirate to invade Iraq. The transfer was carried out by a special train chartered by the Turkish secret services. • In early June, the Islamic Emirate and the Local Government of Kurdistan went on the attack. The Islamic Emirate, in accordance with its mission, spread terror in order to accomplish the ethnic cleansing that the US army had been unable to achieve in 2003. Thus is realized, to use the expression of the US Chiefs of Staff adopted in 2001, the remodeling the "Greater Middle East". So there is no reason for the United States to destroy the Islamic Emirate, if not the publicized - and suspect - death of three of their nationals, which cannot justify the deluge of fire. While it is clear that the main target of the air campaign is not the one that is announced, no one is able to say precisely what it seeks to destroy. The most that can be said is that the United States and its GCC allies bombed empty buildings in Rakka - which had been evacuated two days earlier by the Islamic Emirate, and a dozen refineries in eastern Syria. Bombing of a Syrian refinery by the US Air Force, September 24, 2014. Refineries are among the most expensive industrial investments. So what do these refineries signify in a war allegedly waged against terrorism? According to the Pentagon, they were controlled by the Islamic Emirate and brought it much income. The answer is obviously false. When states under embargo try to sell gas or oil on the international market, they do not succeed. But the Islamic Emirate does, despite resolutions 1373 (2001) and 2170 (2014) of the Security Council. Publicly notorious, it steals oil in Iraq and Syria, routing it by pipeline to the Turkish port of Ceyhan, from where it is transported to Israel by tankers of the Palmali Shipping & Agency JSC, the Turkish-Azeri company of billionaire Mubariz Gurbanoğlu. At the port of Ashkelon, Israeli authorities provide false certificates of origin from Eilat, then they are exported to the European Union, which pretends to believe they’re Israeli. The bombing of these facilities cannot be understood as other than a desire to deprive Syria of its refining capacity when peace returns. 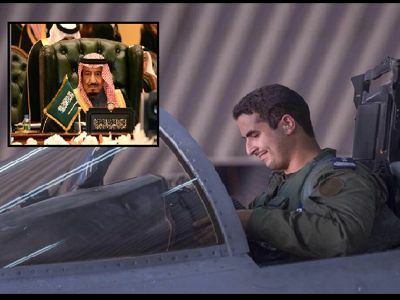 Prince Khaled, son of the heir to the throne of Saud, Prince Salman, participates in the bombing of Syria at the controls of an F-15. It is common knowledge that in this case, the United States relies on members of the Gulf Cooperation Council, and particularly Saudi Arabia. In this regard, if it is clear that Saudi planes are not taking off from their country, information published by Iranian media according to which they are based in Israel, is still not ruled out, but probable. We have often noted that one of the main aims of the war against Syria is the control of its gigantic reserves of natural gas and that of its territory by which could either pass a pipeline from Iran or its rival, Saudi Arabia from Qatar. However, since the resistance of Novorussia and support provided by the Russian Federation, the European Union is trying to overcome its dependence on Russian gas. Hence the Iranian government’s idea to offer its gas on this market, as announced by Deputy Oil Minister Ali Majedi, August 9. For Iran it would be an alternative to the blocking by the Islamic Emirate of Iraq’s road to Syria. This option, which defends Iran state interests, but abandons the anti-imperialist struggle of President Ahmadinejad, could be approved by Washington as part of a broader agreement during the 5 + 1 negociations. Iran would be willing to abandon its groundbreaking research on a method for producing nuclear energy able to free the third world from its dependence on oil energy, while "Westerners" would lift their sanctions. 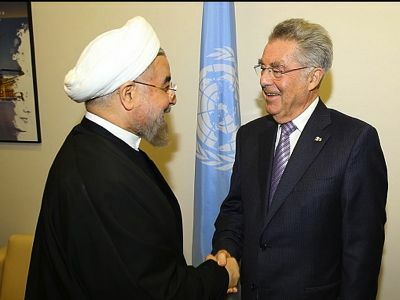 Iranian President Sheikh Hassan Rohani came to explain to his Austrian counterpart, Hans Fisher, his proposal to deliver gas to the European Union (New York, September 24, 2014). The revival of the Nabucco system would be a boon to Azerbaijan which could more easily export production from its Shah Deniz gas field. Thus, Baku would also move away from Moscow to be closer to Washington, which would explain the sudden purchase of arms from Israel. From the Syrian perspective, a shift in Iranian energy policy is not necessarily a bad thing: most of the enemies of Syria - except Israel - would have no reason to continue the war. In addition, the removal of Iran would strengthen the usefulness of Syria to Russia. If the agreement were signed, Washington would further pursue instability in the Sunni areas of Iraq, to maintain a physical separation between Tehran and Damascus, and certainly would support Daesh in Deir ez-Zor, but leave the rest of the Syria in peace. “U.S. 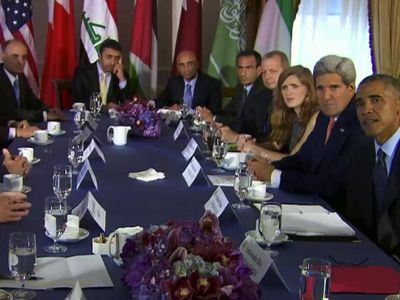 Air Strikes Are Having a Limited Effect on ISIL”, Ben Watson,Defense One, 11 August 2014. “John McCain, Conductor of the "Arab Spring" and the Caliph ”, by Thierry Meyssan, Voltaire Network, 18 August 2014. “Congress secretly approves U.S. weapons flow to ’moderate’ Syrian rebels”, par Mark Hosenball, Reuters, 27 January 2014. “Islamic State of Iraq and the Levant led by Prince Abdul Rahman”, Translation Alizée Ville, Voltaire Network, 4 February 2014. “Israeli general says al Qaeda’s Syria fighters set up in Turkey”, par Dan Williams, Reuters, 29 January 2014. “Jihadism and the Petroleum Industry”, by Thierry Meyssan, Translation Roger Lagassé, Al-Watan (Syria), Voltaire Network, 23 June 2014. « Iran ready to supply energy to Europe via Nabucco », Irna, 9 August 2014. « Iran Ready to Supply Energy to Europe », Shana, 24 September 2014.